THE PASSAGE OF TIME: CCCP TANK ARRIVES! 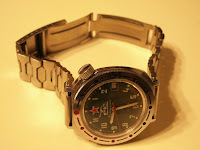 The Vostok Komandirskie tank watch arrives today! Fast shipping! Condition looks great and its a case style that I don't have yet. Seems to be my best 3AKA3 piece so far. This is the seller's picture. Will take photos of my own later. It's a real vintage watch, this one probably from the late 80s or early 90s, just before the fall of USSR I reckon.